Keeping your car in top shape should be a priority for any motorist. With an efficient, clean-running car, you’ll have smoother trips, less vulnerability to more expensive auto repair issues down the road, and most importantly, greater safety. The problem is, few motorists have the technical expertise or experience necessary to diagnose the issues that might be affecting their car’s performance. Regular maintenance at an auto repair center can detect and prevent necessary auto repairs before they grow beyond your control, but it also helps to know the warning signs of some of the most common issues a car can face. The “check engine” light is certainly helpful, but if you’re willing to get on your hands and knees, your tires can clue you in to even more specific problems that could be affecting your vehicle. “Cupping” is a term that refers to a diagonal, regular pattern on your tire. You can think of this as diagonal “stripes” of excessive wear that appear in a specific, regular pattern down the length of your tire. According to Allstate, if you see cupping, it’s usually an indication that something is wrong with your suspension—it could be worn, bent, or otherwise damaged and suffering from a decline in performance. This is a significant auto repair that should be completed as soon as possible, so do not procrastinate. There are a few other potential causes of cupping—for example, you might see it on the rear tires of a front-wheel-drive car if your wheels are out of alignment. It could also be the result of untimely or inconsistent tire rotations. In any case, it is not a sign of normal wear, and should be addressed by an auto repair center immediately. 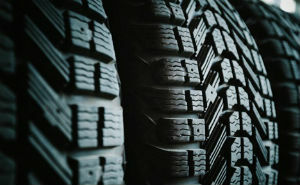 Center tread wear refers to a form of uneven wear that runs down the center of your tire. On the left and right edges, the tread will seem relatively normal, but down the middle, you’ll notice a smoother, almost bald appearance in extreme cases. According to Popular Mechanics, this type of wear is an indication that the tire has been overinflated—and probably for a long time. Center wear can cause further traction and tire problems down the line, so if you notice this wear, adjust your tire pressure to match what is recommended in your owner’s manual. If the tire pressure is correct but you still notice signs of increasing center wear, it could be that your tire and wheel aren’t properly matched. 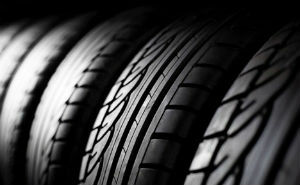 Consult an auto repair center to see if you need a different type of tire. Additionally, some high-powered sports cars can see center wear even with proper tires, proper pressure, and regular auto repair maintenance. Outer tread wear is the practical opposite of center tread wear—you’ll notice the left and right sides (inside/outside) of your tire edges worn down, while the center strip of your tire remains more or less intact. 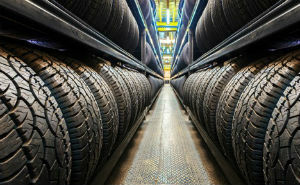 Almost universally, outer tread wear is a sign of under-inflation, which is easy to fix, but can cause massive problems if it isn’t addressed. Under-inflated tires flex more than properly inflated tires, which means you’ll be at higher risk for a blowout, and you might even force your wheels out of alignment. The solution for under-inflated tires is to inflate them properly. Check your owner’s manual to acquire the correct pressure for your model, and check your tires regularly to ensure they are properly inflated. Uneven wear is a bit trickier to diagnose, since it doesn’t form any certain pattern, and might appear or feel “patchy” to the observer. You’ll notice single isolated spots of tread wear, but the rest of the tire might look perfectly normal. Typically, this form of wear is the result of isolated incidents—for example, if you slam on the brakes and lock them (assuming you don’t have an antilock brake system), you could create a small flat spot. Worn spots can also emerge in cars that are parked without moving for long periods of time. Generally, uneven wear doesn’t indicate a bigger problem in the performance of your vehicle—but it’s still a good idea to get the tires themselves replaced. “Feathering” is a term that refers to the ribs of your tread being smoother on one side and higher on the other, making them look like feathers or ramps on your tire. If you’re concerned about feathering, but aren’t sure if your tires display the condition for sure, run your hand along the outside—in a case of feathering, you’ll feel somewhat sharp edges in a rough pattern. Feathering is almost always a sign that your wheels are out of alignment, and the severity can indicate the severity of the misalignment (or the amount of time it’s been in existence). According to Bridgestone, feathering comes as a result of an improper toe alignment, which means your tires are pointed too far inward (“toe in”) or too far outward (“toe out”), instead of facing straight forward. If your toe alignment is correct, the feathering could be a sign that your suspension bushing is damaged or worn. If you notice any of these signs on your tires, it’s a clue that you should bring your car in for auto repairs as soon as possible. Allowing the problem to continue will only put you at further risk, and could possibly increase the total cost of your auto repairs by exaggerating the scale or intensity of the problem. An auto repair center like The Garage will be able to detect any potential problems with your vehicle immediately, so if your tires suggest that something might be off, schedule an appointment right away. Even if your tires don’t display evidence that a major problem is affecting your car’s performance, it’s a good idea to bring your car in for regular maintenance and diagnostics. You never know what problems could be lurking in the background.